In medium microwavable bowl, microwave white vanilla baking chips uncovered on High in 30-second intervals, stirring after each interval, until smooth. Do not overheat; it’s okay if a few lumps remain. Keep stirring, and they should melt completely. In another microwavable bowl, microwave frosting uncovered on High 20 to 30 seconds or until melted. Mix melted chips and frosting together; pour into pan. Refrigerate until set, about 1 hour. Cut into 6 rows by 6 rows. 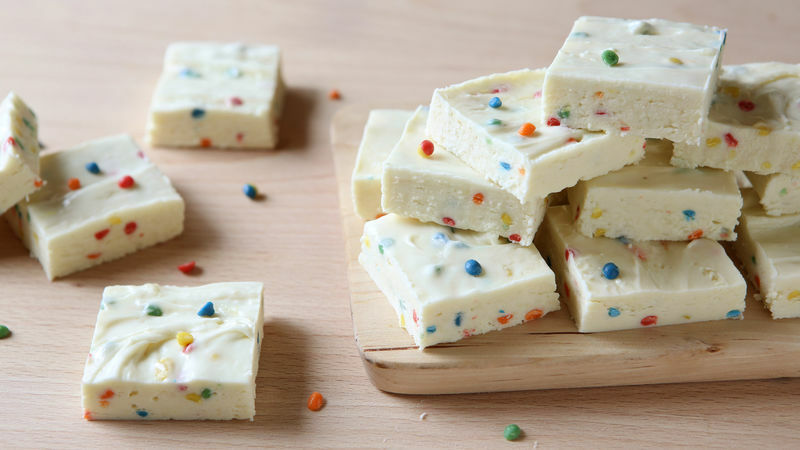 This fudge is slightly soft at room temperature. If desired, store in refrigerator. Look for white chips that contain cocoa butter. They will melt more easily and are less likely to scorch when heated. Line the pan with parchment paper with overhanging sides to make removal easy and mess-free.